At some point in our lives, we've looked at a photo of a celebrity on the red carpet and coveted their dress (to wit: Lupita Nyongo's blue Prada Oscar dress). 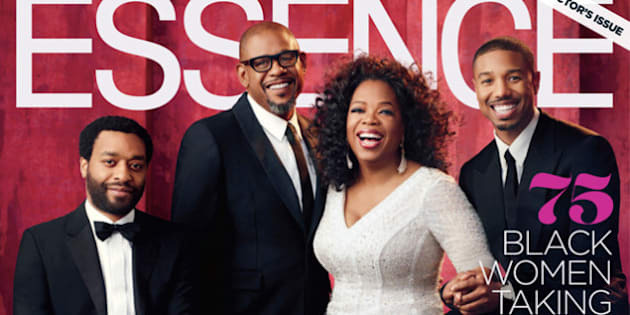 So, leave it to Oprah Winfrey for making that dream come true for one lucky fan! Atlanta, GA., resident Brandi took to Twitter to ask the media mogul if she could have the dress the "Lee Daniels' The Butler" star wore on the March 2014 cover of Essence. In the tweet, Brandi joked that Winfrey wouldn't wear the dress again and surprisingly enough, the OWN mogul replied, saying, "You're right, I won't," and told Brandi to contact her assistant to arrange to get the dress. @snobaby28 you're right I won't wear ever again contact my asst. and show her this tweet. Crazily enough, Oprah kept her promise and the dress, a gorgeous Brian Rennie for Basler gown with a feathered skirt and structured bodice, was delivered right on time to Brandi. @Oprah THANK YOU! Recv beautiful dress. Plan to wear at my wedding when I find a groom lol but will twt pic wearing it soon. Luv u to life! We hope that Brandi gets hitched soon so we can see the pics!